Context: Daffodils abound in the spring sunlight while I read this mostly on walks to and from work. The wife read this before me. That doesn’t often happen and so, when she said it was good, I thought I’d have a go at it. It’s a very quick read: lots of blank pages between ‘chapters’ that consist of little more than a short paragraph sometimes. But, yes, I rated it okay… just. It’s not the actual writing that weakened the book for me. Walker writes in a lyrical poignant style that balances western realism with elements of magical realism at times and this definitely contributes to the portrayal of an African immigrant to the US. No, the writing was fine. It was the content that was the problem. Let me explain why. The issue, you quickly find out, is female circumcision. The fact that I have to write female there shows, to a certain extent, what Walker’s point in writing the novel is about: ignorance. Most people, the novel claims, have no idea that this practice goes on. The other agenda of the novel, apart from raising awareness, is to argue very strongly for stopping it. Now, I do understand that this is a painful thing and that it does rob women who undergo it of some of their physical functions. I am sympathetic to the point she makes. But she shoots herself in the foot for two reasons. Firstly, the feminist slant alienates probably the people who are most likely to have a say in these cultures about whether this practice continues i.e. men. In the majority of these communities, for better or worse, men hold the power still. I’m not sure that making this a women‘s rights issue is going to help get their participation. Secondly, and this is a bigger issue for me, what about living and letting live? There was very vocal opinion recently that a never before known Amazonian tribe should be left untouched by ‘civilisation’ and allowed to continue their lives as they have always been. In anthropology, you observe, you study but you do not become an advocate for change. Anthropologists classify that along with other more traditional forms of Imperialism, like, say, genocide. Now I work for SIL, a linguistics organisation that has come under much criticism in the fifty or so years since its inception. That criticism has been directed at policies we have to change cultures. There, I’ve said it now. We do want to change cultures. We want to eradicate injustice, inequality and poverty. We want to raise up the downtrodden and provide rights for the alienated. We do this through language, literacy being one such example. But to work social reform in such a way means, inevitably, to change the way the communities operate. To leave them as they are would be to maintain the very social systems that oppress. In this sense, Walker and I bat for the same team. If I’m labelled as an Imperialist for pursuing such goals then so be it. I can live with that. The people I serve have lived with far far worse. But I wonder if Walker would be one of our critics? Hmmm. Who’s to decide that female circumcision is to be outlawed? Who’s to decide that illiteracy is to be eradicated? Once you start debating that, what seems a water-tight case for the removal of the practice of female circumcision actually turns out to be on very shaky ground. What other practices don’t we like? What others can we argue for the removal of? How much can we decide how other cultures around the world can operate? And while we do this, do we remain ignorant of evil in our own backyard? I’ve had to consider these issues carefully in my line of work. Walker is, as far as I know, a novelist. It’s easy to write a book about what you feel strongly should be changed. But go out and try to change it and you’ll find yourself in a minefield of ethics. 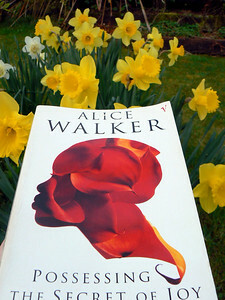 I just don’t think Walker’s considered the ethical issues enough in this novel and it is, for me, naive for not doing so. Well-written, but naive. I did not realize for a long time that I was dead. An American… looks like a wounded person whose wound is hidden from others, and sometimes from herself [sic]. I am quite surprised that you thought this book was just Okay. I myself thougth it was rather good. As you say it raises an importnbat issue which many people need to be made aware of. I think you have raised some intersting points about eithics and how far you can go in ‘changing’ and ‘affecting’ other cultures. In some ways I had not really thought of those in such depth. I still feel wuite strongly though that this issue is a matter of oppression and injustice. But as you said how one goes about doing anything about in and in appropriate way is very difficult. Glad you enjoyed the writing though which I thought was rather good and quite clever.